When I preach, I preach without a manuscript so that I can connect with people. What does that mean? It means I write out the whole sermon and then I try to absorb and ingest it and then I leave it behind when I preach. I have chosen to do it that way so I can look people in the eyes and have it feel more like a conversation because I can see how they react and respond. The downside to preaching that way is that sometimes I have written something into the sermon that I end up forgetting to say in the moment! Yesterday I preached from Luke 3:1-22 and I raised the question of whether John the Baptist really knew Jesus since the Jesus he portrayed in Luke 3 was not exactly the Jesus of the gospels we have come to know. John describes Jesus as a kind of Harry Potter sorting hat who is going to sort people into good and bad, worthy and unworthy. John’s language and imagery is way more scary than J.K. Rowling’s, though. It’s one thing to end up in Slytherin, it’s quite another to be thrown into the unquenchable fire. As I often do, I questioned the theology in the text and I even made a statement that I knew would raise some eyebrows about how God is less concerned about our individual salvation than about our collective salvation. Okay, maybe I also questioned the notion of salvation and what we have been taught about it versus what it can be when we approach it from a community standpoint. It’s also possible I undid a few threads related to original sin and suggested original goodness might be a better way for us to form identity. But the one thing I forgot to say anything about was repentance! John the Baptist preached about repentance for the forgiveness of sin. It’s true I don’t love the theological words that imply we are anything less than Beloved. It’s also true I don’t love the theological words that are hard to access for people outside of the church. Honestly? The word repentance is just loaded. I believe part of my job as a preacher and pastor is to reframe some of the words that have been used as bully words. Repentance is one of those words. When someone else suggests you should repent, they are telling you in some way that you are not enough, that you are missing the mark, that you are not okay, that you should feel a particular way (regret, remorse, contrition). The word repentance is deeply connected to individual salvation in that repentance (asking for forgiveness and expressing sorrow or guilt) is necessary in order to be saved. If you believe in original sin, the idea that sin is in our very being, then the idea of repentance makes sense as you become conscious of and able to identify all of the ways that sin might manifest itself. What if you don’t subscribe to original sin, but instead believe original goodness, the idea that we were each created in the image of God and that we each have that of God in us? What if you believe you are fundamentally good and that everyday is an invitation to live into God’s image in you? What part, then, would repentance play if any? I like the image of repentance as a turning away from and a turning toward (the greek concept of metanoia). When I think of what I might want to turn away from and turn toward, I think of turning away from overwhelm and anxiety and toward mindfulness and priorities. I think of turning away from fear and toward honesty and integrity. I think of turning away from shame and toward loving acceptance. I think of turning away from hopelessness or apathy and toward hope and community action. In other words, I understand how important it is to change the way we think, the way we move in the world, the way we behave sometimes. Whether or not we are able to turn ourselves around has a real impact on the communities in which we live – our families, our churches, our cities, our chosen families. I still don’t love the word repentance and I rarely use it. In the right context, though, with reclaiming some images, I like to think my intention is to live it. How about you? What do you want to do turn from and then turn toward? How would you like to change your direction in order to live into God’s image in you? This entry was posted in Uncategorized on January 9, 2017 by revbethb. 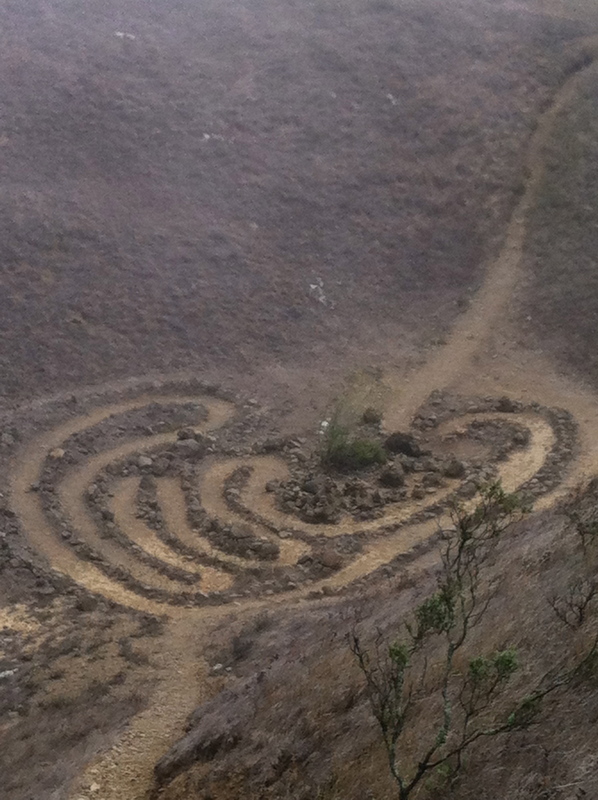 In honor of my first blog post at this new site: The picture of the labyrinth on my home page is from hiking up into the Sibley Preserve in the Oakland hills where several labyrinths were carved into the ground in the 60’s and are still maintained. The heart shaped labyrinth is my favorite! The first few times I was invited to walk a labyrinth, I felt like an oddball. Everyone else seemed to take to it like fish to water and I was more like a cat to water. The resistance I felt was as strong as a cat resisting taking a bath. If you have ever attempted to bathe your cat, you’ll know what I mean. When my wife, JE, brought home two adorable kittens from school one day without asking me if I wanted said kittens, one of the arguments she used in her “why we should keep these kittens” speech was that the owners claimed that they had been bathing the kittens since birth and the kittens loved being bathed. My inner skeptic attempted to tell her I had never heard of a cat or kitten who liked to be bathed, but she insisted it was true. After they had been with us for a couple of days, she decided to treat them to their bath. Still skeptical, I decided to stand by in case of any life-threatening injuries. Wearing a tank top and some long yellow rubber gloves, she filled the kitchen sink with water and grabbed one kitty in each hand. As she dipped them into the water, they resisted with all of their might. In a millisecond, they had managed to claw their way up her arms and over her shoulders and she was yelling and they were meowing and it was an unholy mess. Apparently, the kitties did not love to be bathed. Like the kitties in water, I resisted the labyrinth the first few times but in a much less vocal and harmful way. I stood by and watched as others walked. When standing by was too awkward, I walked it, but not with any purpose in mind. I simply walked. I didn’t hear anything from God, nor did I say anything to God. I didn’t feel any more connected to God or to the people around me. You see, walking the labyrinth in a crowd of people seemed forced to me. How could I go at my own pace? How could I listen, pray, seek, hand over, or even breathe without having to focus on the people in front of me and behind me? Part of me wondered if the other people doing it were simply more spiritual than I. No one else who was watching would have guessed that I was feeling such resistance. I looked like everyone else who was doing it. Eventually my mind went to that place where one begins to wonder if other people are faking it, too. It took me many more years after those initial attempts to experience the labyrinth as invitation rather than a forced attempt at spirituality. My guess is that we each have our own experiences of forced spirituality. Sometimes we are in a room full of praying people and just don’t feel like praying. Sometimes the basket is passed and we just don’t feel like giving. Sometimes hymns are sung that we just don’t feel like singing. Sometimes sermons are preached that we just don’t feel like hearing. Sometimes peace is passed that we don’t feel like passing. Is it okay to fake it? I think so. I faked it on the labyrinth for many years until one day I actually had an experience on the labyrinth that was unexpected and powerful. The labyrinth can remind us that we are not God and we do not have to carry the weight of the world as though we are God. When we get to the heart of the labyrinth and God, we remember who we are and who God is and why it’s better to walk out of the labyrinth with a lighter step and greater awareness. 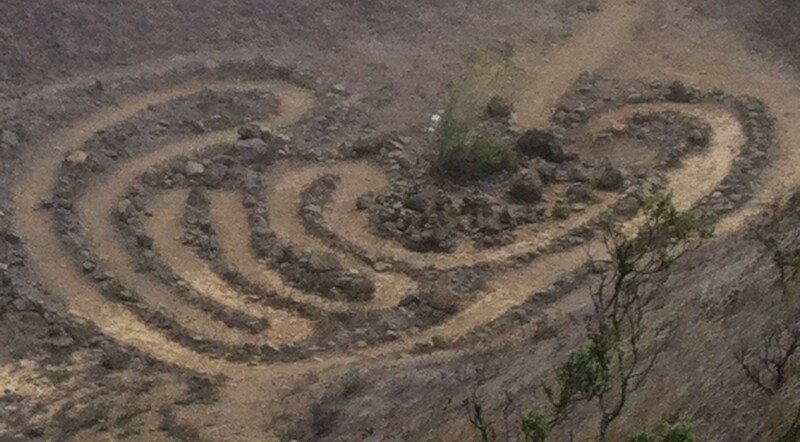 Two summers ago, I was on yet another spiritual retreat and we were asked to walk the labyrinth as a group. As a good group member, I went through the motions and did what I was asked and once again felt less than spiritual. Later that day, though, the labyrinth was calling to me. When I was alone, I walked back over to it and stared. I turned around and enter into the labyrinth backwards. Every step was unfamiliar and risky. My pace was slowed way down in order to figure out the way. My balance was off because I couldn’t see what was next. Despite the jarring experience, I felt comforted. The message I received was “Welcome to the next year of your life.” Indeed, my experience of that next year was a mirror of that experience of walking the labyrinth backward. As I searched for and found my next call to ministry, I remembered the labyrinth and how I had been comforted and held in the midst of my own discomfort and fear. We don’t get to decide how and when God shows up. My experience in life has taught me that if I keep showing up, God does the same in all kinds of ways and all kinds of times and rarely when or how I expect it. This entry was posted in Uncategorized and tagged Labyrinths, Spirituality on March 18, 2014 by revbethb.